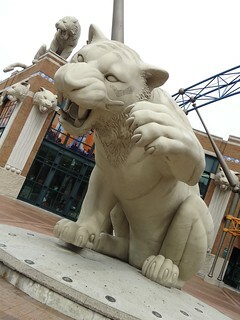 For better or for worse, Detroiters love their sports teams; over the last decade the Detroit Tigers have been both. The Detroit Tigers are one of eight franchises that originally made up the American League; they are the oldest, continuous one-name, one-city franchise in the league. The Tigers have won four World Championships. Comerica Park opened in April 2000 to mixed emotions; it was hard to let go of the old stadium. Fortunately, the Ilitch family was thoughtful of the past and included it in the present building. 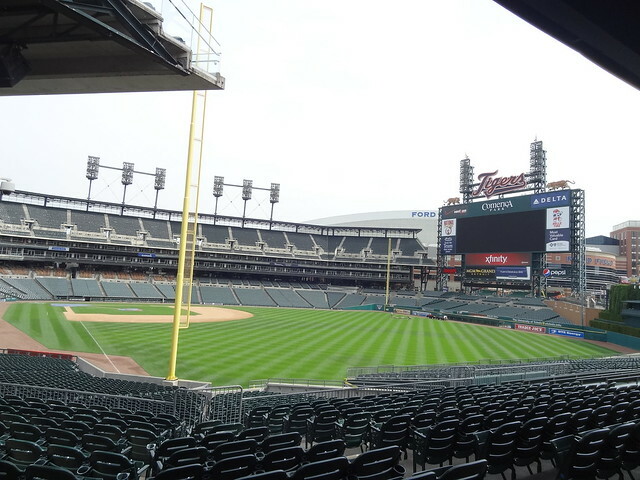 We have been lucky enough to get down to Comerica park to see a few games this season, the last time we were there we thought it would be a lot of fun to come back and get a tour, so that’s exactly what we did! 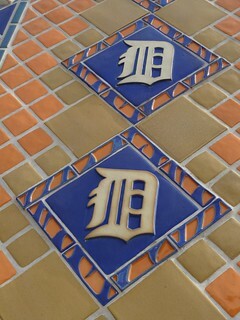 If you have ever seen Comerica Park there is no mistaking what goes on there; a huge Tiger sits outside the main gate, gigantic baseball bats flank the entrances and tiger heads with baseballs held in their teeth stud exterior walls, handcrafted Pewabic tiles with the Old English D decorate the brick walls. If you pass by the stadium day or night, summer or winter, you are sure to see folks having their picture taken with the big cat out front. We purchased our tour tickets at the box office on Witherell St, I was surprised by the number of people waiting for a tour on a Friday at noon. Our guide met us in the Tiger Club Lobby and we were off. We were not more than a few feet into the building when our guide broke the news that we would not get to see the clubhouse, dugouts, batting tunnels or suites, as workers were preparing for a fantasy camp taking place over the weekend; major bummer. My advice to you would be to call ahead and ask if the full tour is available before you make the trip; when I purchased the tickets I was not told it would be an abbreviated tour… Off we go! We walked along the concourse, there in the distance was the field; manicured, lush, green grass, a diamond shape in the middle outlined by a dirt track with white bases at the corners, it’s beautiful. 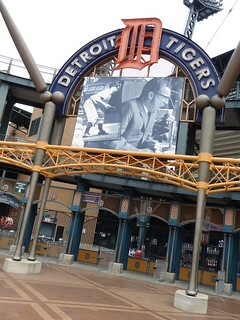 The scoreboard is one of the largest in baseball; the large tigers on each end are painted life-like, stalks of stadium lighting bookend the Tigers team name. We walk the wide concourses passing the tunnels we will not see, we arrive at centerfield and the Statue Gallery. 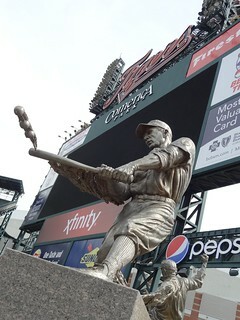 The sculptures represent six of the Tigers all-time great players; Ty Cobb, Charlie Gehringer, Hank Greenberg, Willie Horton, Al Kaline and Hal Newhouser. Cast in stainless steel, each stands on a granite pedestal and is about 13 ft. high; the past connecting with the present. Next we entered the space where the TV cameras are set up during a game, not a lot of room, but what a view! What we didn’t know is that one of the couples on the tour was about to become engaged, the man had arranged the whole scene; Tiger jerseys bearing his last name hung on chairs, the rest of us gathered on one side as he got down on one knee and proposed….luckily she said ‘yes’, tears fell, hugs and kisses were exchanged. Once the ring and jersey’s were in place, we were ready to move on; next stop, the Walk of Fame. Along the circumference of the lower level is a series of towers that are decorated with historical elements from Detroit baseball history,they are referred to as decade monuments. Anybody who goes to a game can check these out, so next time you’re there have a look. The bottom of the monument is made up of tires that would have been seen on cars of that era, this is the motor city after all. 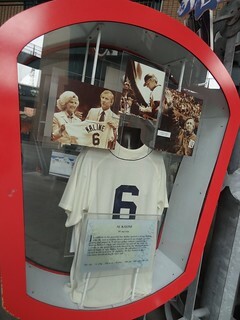 Looking up from there are photos of players, uniforms, tickets, and a radio from that time period, very interesting; a little further on a statue of Ernie Harwell stands alone. 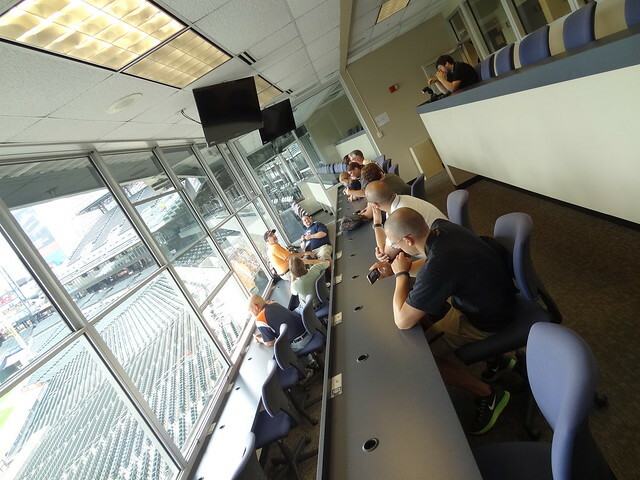 We head up the ramp, disappointed we cannot get into a suite today, we continue on to the press box, known here as the Ernie Harwell Media Center. We each take a seat and for a second get to see what it feels like, again the green of the field getting our attention. To the right above the centerfield wall is the Chevrolet Fountain; referred to as liquid fireworks the fountain celebrates home runs during a game. Behind the fountain, in the city itself, the Detroit Athletic Club keeps watch over the park, the top of the renaissance center glows in the distance. Fan sight lines were one of the top priorities in the design of the park, you really feel you are part of the city when you attend a game; the sides of the park are open enough for passer-bys to stop and watch an inning or two. We walked down aisles noticing the different styles of seating available, the closest we got to the field was the first row of seats next to the Tiger dug out, we all leaned over to have a look at the dug out itself; the tour ended here. 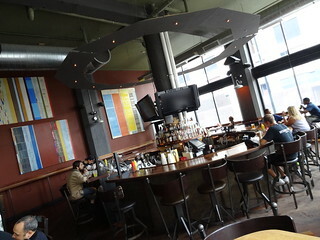 About two blocks from Comerica Park is a little place called the Bucharest Grill, it is actually located inside Park Bar on Park Ave. We took a seat at a high top table by a window facing Park; I grabbed a menu and we took a look. Bucharest Grill is probably best known for their Shawarma, and for good reason; it’s outstanding, but they also serve amazing hot dogs. Since baseball and hot dogs got hand in hand that’s what we were in the mood for. I went over to the register at the Bucharest counter to place my order and Kris went to the bar to get our drinks, I returned with a red plastic number, he with a New Holland Oatmeal Stout and a whiskey and coke. Our food arrived quickly in cardboard containers with paper wrappers and plastic utensils; it’s what’s inside that counts! Everything here is handmade from original recipes, we’ve never had anything we didn’t like. Today we ordered the House Salad; vine ripe tomatoes, chunks of red onion and cucumbers with lots of Feta cheese crumbled on top, so simple, but so good. 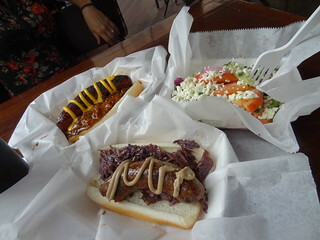 We had a Hamtramck dog that is a polish type sausage topped with braised red cabbage and a brown mustard, absolutely delicious! The Detroit Dog is a handmade hot dog with an outstanding chunky type chili with yellow mustard, my mouth is watering just thinking about the food, it is so flavorful. We didn’t really have room for dessert, but we always have room for coffee. 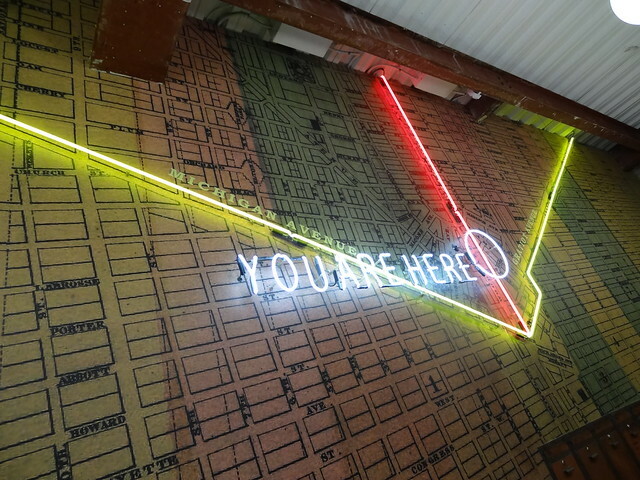 We wanted to check out Chez Zara’s new space in the M@dison Building on Broadway, so that was our next stop. We lucked out with a parking space right in front, and went inside. 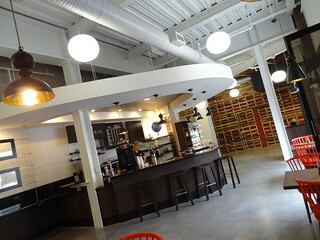 The coffee bar has a modern, contemporary feel to it; concrete floors, white ceiling, globe lights, a pop of color in the red chairs and some personality with the wood covered wall and giant street map of downtown. I love Chez Zara for their Nutella Latte, what can I say? A warm espresso drink with creamy chocolate and hazelnut, I can’t resist; Kris has been on an iced coffee kick for a while, it was that kind of summer. We ordered our drinks and had a seat at the counter, as always the coffee was excellent. Chez Zara serves espresso drinks, organic teas and petite pastries; we did splurge and split a caramel meringue, also very good…..It’s a great space with a great view, they should do well in their new home. 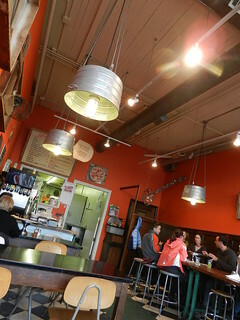 The first thing on our Friday agenda was lunch at Supino Pizzeria in Eastern Market. We easily found street parking, and were relieved to find open seats available. This tiny space has a big reputation for excellent real Italian-style pizza. 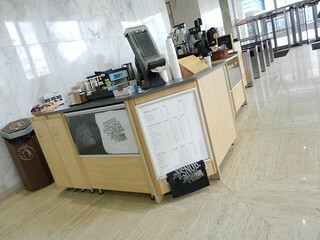 Order at the counter; selections are written on chalk boards. There are two varieties: Red, which comes with sauce and white which has no sauce. Choose from one of the many tempting selections such as The Supino with roasted garlic, black olives, chili oil, ricotta and mozzarella or the Bismark, it has fresh mozzarella, prosciutto, and egg. There’s the always delicious Margherita: fresh basil, fresh mozzarella, tomatoes and Parmigiano or our choice Primavera: tomatoes, artichoke, eggplant, onion, spinach and mozzarella. Or create your own, pies come in two sizes, 12″ or 18″. We took a seat at a small table in the window and waited for our food to arrive. The space is set up in community fashion; long wooden tables encourage strangers to sit side by side and engage in conversation. It has a laid back, funky, market feel to it; black and white checkered floor, upside down wash tubs serve as light fixtures, large pieces of art work hang on the walls. The clientele runs the gamut from suburbanite and business professional to locals. Our salad arrived quickly, topped with homemade Lemon-Basil Citroneette, it was very tasty. The pizza followed shortly, the hand stretched dough took on more of a free form shape as opposed to the typical circle. Cut into four large slices, the crust has an initial crunch followed by a chewy deliciousness that only comes from great dough. The toppings are proportioned nicely, just enough of everything. It was mid afternoon and although the dining area had cleared out, there was still a steady stream of folks picking up a slice or a whole pizza to go. It can be crazy busy on market days, but they are open during the week too. 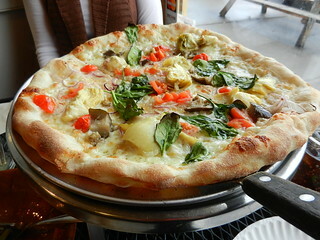 Next time you’re in the mood for some really good pizza think Supino! 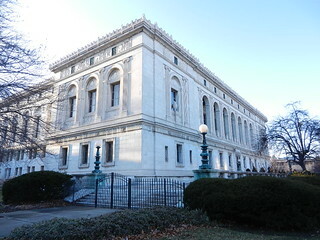 The Main branch of the Detroit Public Library was built in 1921. Designed by Cass Gilbert in the early Italian Renaissance Style, this place is gorgeous! 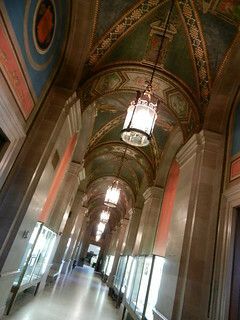 The original entrance of this large stone building rests below beautiful archways that overlook Woodward Avenue. Once inside you will notice the richly painted ornate ceiling, tall columns and stairways, this lets you know that it is an important building. To the right is the HYPE Teen Center, individuals sit at available computers, as groups of youngsters gather together to play a video game or just catch up on the days events. 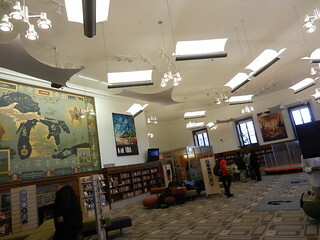 Many areas of the library have been updated such as this space, without disturbing the original integrity of the architecture. 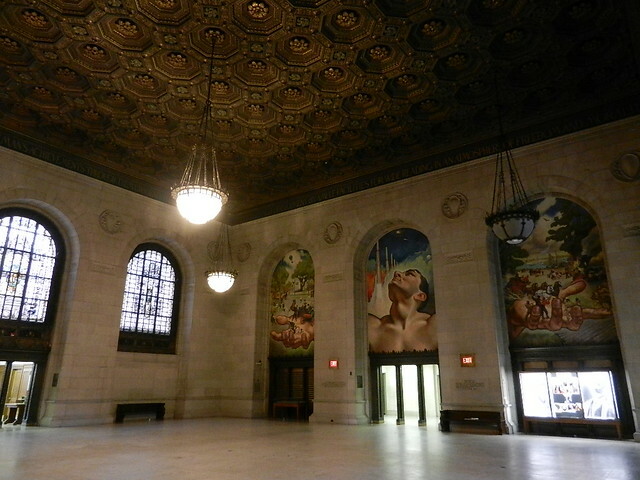 In this room you’ll find a fireplace with a stunning tile surround and above that the Pictoral Map Of Michigan by Frederick J Wiley completed in 1923. 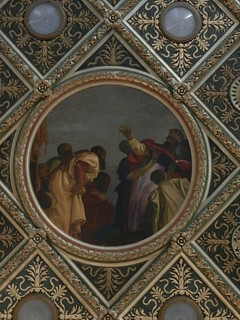 Within the mural you will find the two Latin Mottoes: Si Quaeris Peninsulam Amoenam Circumspice and Tamen Fit Surculus Arbor, which translate into “If you seek a pleasant peninsula, look about you” the present motto of Michigan, and “The shoot at length becomes a tree” the motto of Michigan when still a territory. 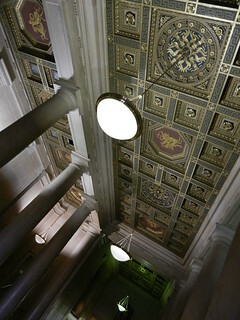 Next walk up to the third floor, pay attention to the detail in the ceiling on your way up; look carefully and you can find the seals of the City of Detroit, the state of Michigan, the United States and the University of Michigan, it’s absolutely amazing! 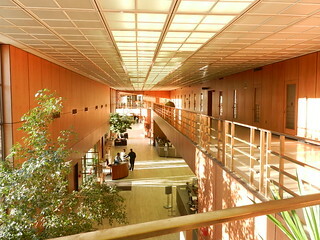 On the third floor is Adam Strom Hall, here you will find another series of murals along the East and West walls. Whenever we come up here we like to take a seat on one of the benches to sit and stare for a while. Grand light fixtures strung from chains hang from the ceiling, stained glass windows are embellished with colorful scenes, ceiling panels glisten as light reflects off gold-painted rosettes. It’s all very intricate and awe-inspiring. The murals tell the story from the days of Cadillac’s landing to the evolution of man’s mobility. 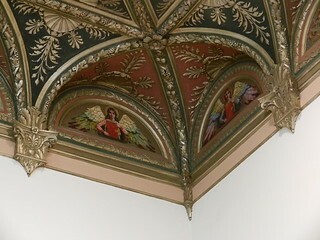 Walk around the third floor hallways and take it all in, get a good look at the grand staircase murals. When your neck has had enough it’s time to move on and forward in time to the North and South wings that were added in 1963. Immediately you will recognize the clean lines and signature accents of Modern architecture. Here you will find large glass windows, brass railings in straight lines or circular patterns, wood panels and lush green plants. The space becomes bright, light and airy. 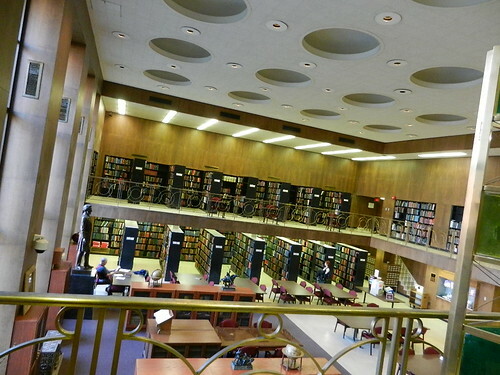 In this section you will find the Burton Historical Collection. The emphasis here is placed on the history of Detroit and Michigan from the time of settlement in the 17th Century to the present. It also includes the Great Lakes area, New England, New France, the US and Canada. The Burton collection is mind-boggling; from the Ernie Harwell Collection to the original manuscript of Huck Finn and Tom Sawyer Among The Indians to original pictures, drawings and manuscripts donated to the library from Laura Ingalls Wilder, you could spend an entire day right here. If you’re researching your family tree chances are you’ll find information here they house church records of baptisms, marriages, deaths, records from the military, immigration, obituaries and land records. 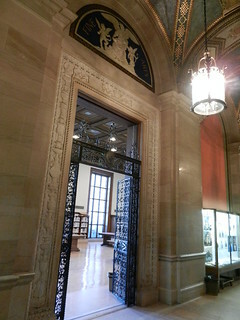 All materials are reference and cannot leave the reading room, so plan on spending some time here when you visit. 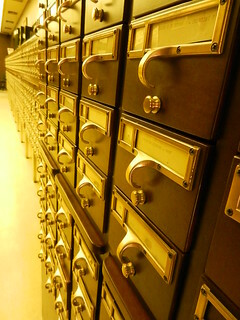 If you’re looking for rare books, first editions, vintage postcards, maps or photographs, they have it all. 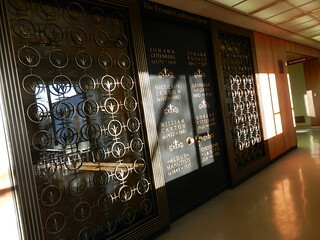 Be sure and step outside to view the incredible mosaics above the Cass entrance. Time for a little coffee break. We did a post earlier in the year on Chez Zara located on Woodward near Campus Martius, since that time they have closed that location and opened a kiosk’s in the lobby of the Chase Tower. I have always liked the looks of this building; designed by Albert Kahn and built in 1959 it is definitely a great example of Modern Design. 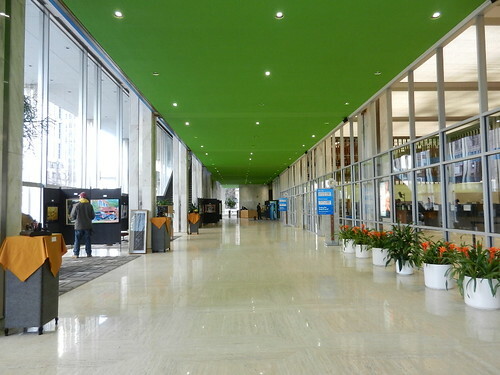 Purchased by Dan Gilbert in April of 2011 the building has undergone some sprucing up. We came in through the Woodward entrance, the contrast between the white of the walls and bright paint colors is really eye-catching, it works with all the natural sunlight streaming in the windows. The first floor is being transformed into a bit of a public space; casual seating areas are arranged around the perimeter, funky modern furniture invites you to sit and relax. 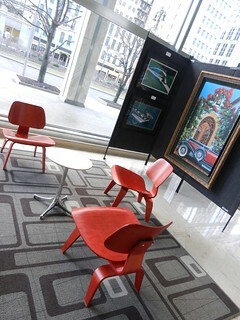 A wonderful collection of automotive themed artwork from paintings to sculptures was on display. We went straight to Chez Zara to order our drinks, I stuck with their signature Nutella Latte; you just can’t go wrong with that choice, rich espresso with a hint of hazelnut and chocolate, creamy, warm and sweet goodness from first sip to last. Kris had straight espresso. We took our beverages over to a nearby seating area with a table and chairs overlooking the street scene. What a nice way to kick back and enjoy a little leisure time. Chez Zara is open Monday thru Friday for your coffee drinking pleasure. UPDATE: Chez Zara has closed permanently.